Sunset, originally uploaded by Alan Perryman. My Nokia N96 may have the most awful user experience and a pretty poor user interface but it can take a good photo. Maybe it’s worth keeping when the contract runs out, as an ‘internet enabled camera’! Day 3 started a bit saddle sore, so we decided to have a much easier ride. 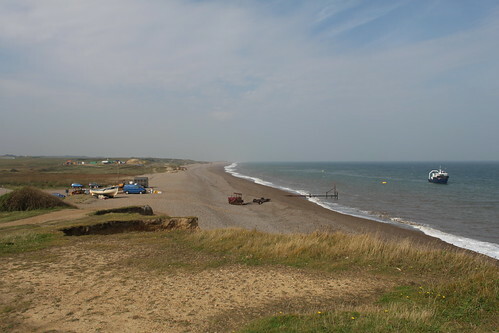 After the full breakfast, we took to the coastal road (A149) to Weybourne around 3 miles from Sheringham. Here we found a beach to relax on. But that didn’t last long – I am not really a beachy person and I wasn’t really in the mood to just stop. 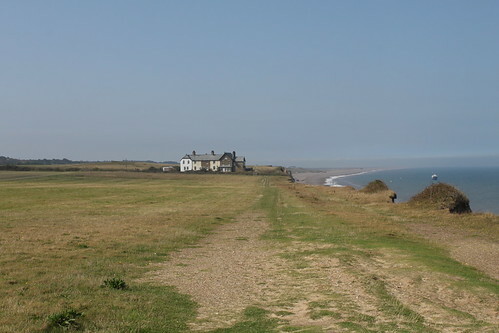 So I left Ruth on the picnic blanket reading and cycled on up the coastal path a short way, where I came across these houses, very much epitome of Norfolk isolation. I bet you could easily loose yourself in the peaceful surroundings, though I can’t imagine it will be much longer before the sea claims these. Further to the left there was a windmill that had been converted to a house – good call, definitely somewhere to be envious of! We had tea in the garden of sort of house/shop/cafe on the road back into the Village before grabbing a quick half pint in the Ship. 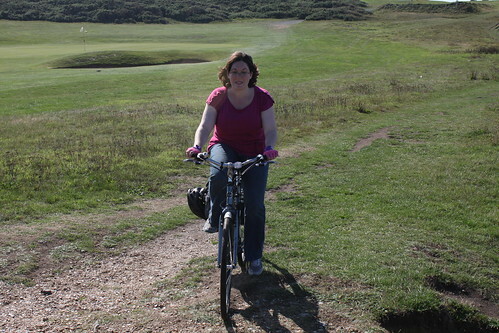 We’d been convinced by the cafe owner to try cycling back along the coastal path – much less busy – though I’m not sure Ruth’s bike was too suited to the job! It was nice to cycle alfresco as well. I’m not going to take sides in the ‘great helmet debate’ but travelling along the coastal path slightly faster than walking speed (probably around 6 or 7 mph) it was nice to really feel the wind in your hair. The coastal path clings to the cliffs above the beaches and eventually we gave way to the temptation and went down to the pebbles. I know beaches and bikes are probably best kept apart, but I couldn’t help belting along the sand until we reached the busier beach at Sheringham! 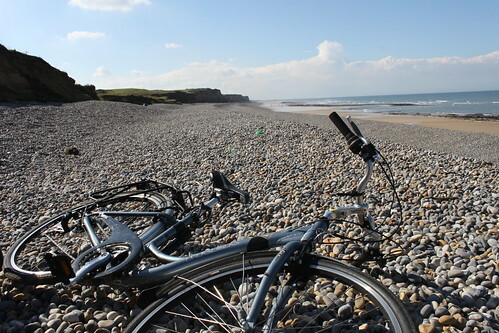 Ruth, sensibly kept her bike off the sand. Well, I figure mine probably needs replacing with something more useful next time the cycle to work scheme comes around. 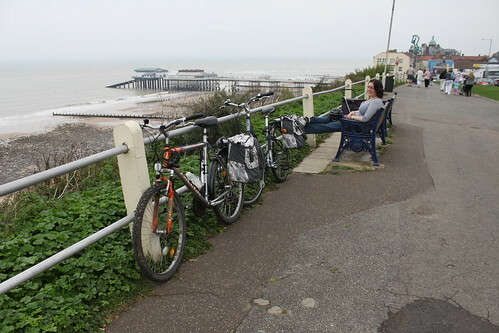 Ruth pitched up on Sheringham beach with our bikes and I strolled up to the High St to find a garlic chip butty that Ruth had been hankering for since we had booked to visit Sheringham. And then unusually for me I went for a paddle in the sea. 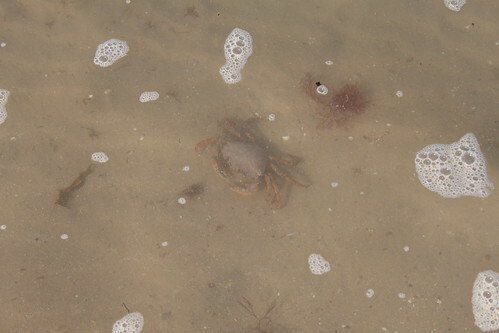 All elements of a seaside holiday were now successfully ticked off. After the beach we headed back to the B&B taking a picnic home rather than eat out again – nice to slob about a bit and watch some TV with some tasty treats! A quick rest, originally uploaded by Alan Perryman. 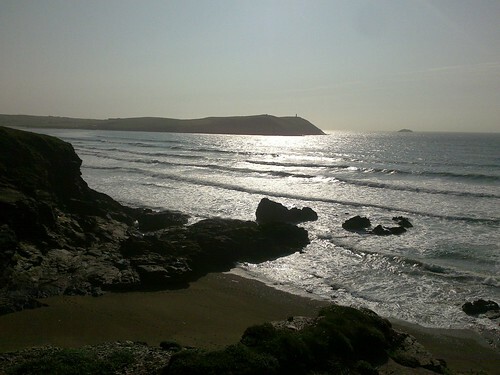 For a bit for calm after yesterdays rage, I present: the sea. Anyway… back to the real reason for the post. Here are those photos. I have to say I am not hugely impressed with the Jessops film to CD processing, though I guess for £2 a roll you can hardly expect fabulous results.